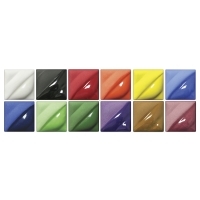 Lead-free Amaco Velvet Underglazes are opaque underglazes that have the appearance of velvet when left unglazed. Velvets will become opaque after three coats. When glazed with transparent matte glaze they will assume a soft, satin finish. 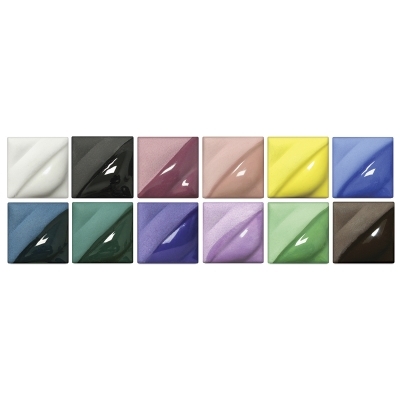 The colors will intensify when covered with a clear transparent gloss glaze, but will lose their matte surface quality. Velvets fire true to color from the jar and may be intermixed with other colors. They may be brushed on mature fired bisque before applying a covering glaze. 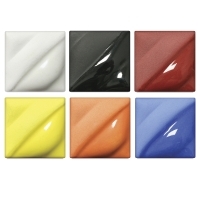 These underglazes are safe for spray application and are dinnerware safe when applied and fired under Amaco LG-10 Clear Glaze. Velvets tolerate a wide firing range. Fire to Cone 06-10 (1855°F–2381°F, 1013°C–1305°C). 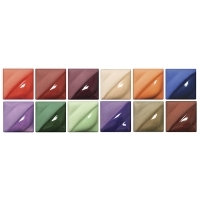 Set #2 — Contains 2 oz jars of 12 colors, including one each of Ivory Beige, Terra Cotta, Deep Yellow, Red Brown, Peach, Lavender, Salmon, Baby Blue, Turquoise Blue, Avocado, Royal Blue, and Chartreuse. Set #4 — Contains 2 oz jars of 12 colors, including one each of Rose, Medium Blue, Light Green, Dark Green, White, Jet Black, Teddy Bear Brown, Amethyst, Electric Blue, Bright Red, Flame Orange, and Intense Yellow. Set #3 — Contains 2 oz jars of 12 colors, including one each of Violet, Amethyst, Red, Light Red, Real Orange, Mint Green, Medium Brown, Royal Peach, Maroon, Hunter Green, Cinnamon, and Electric Blue. 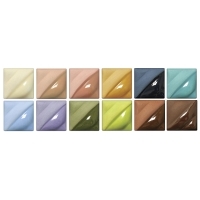 Set #1 — Contains 2 oz jars of 12 colors, including one each of Yellow, Chocolate Brown, Light Pink, Lilac, Purple, Medium Blue, Teal Blue, Blue Green, Leaf Green, White, Velour Black, and Rosy Mauve. 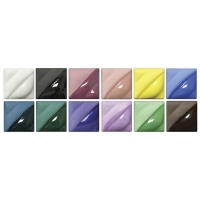 Class Pack of 12 — Includes 16 oz jars of the following colors: Yellow, Purple, Medium Blue, Royal Blue, Dark Green, Leaf Green, White, Jet Black, Amethyst, Red, Light Red, and Real Orange. 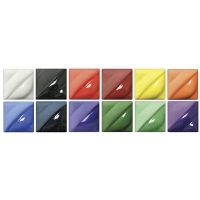 Class Pack of 6 — Includes six 16 oz jars, one each of Yellow, Medium Blue, White, Jet Black, Red, and Real Orange.